Our 1978 image shows this modest single storey retail building operating as an auto glass supplier. For many years it’s been used as a thrift store, but relatively unchanged in appearance in nearly 40 years. We saw in our previous post that it looked significantly different when it was first built in 1917, occupied in 1921 by Ford dealers Dixon Motor Co. In 1925 Dixon’s were still in business, and Mutch’s tire store was next door, at 1275 Granville. That’s a 2-storey building from 1912 developed by R Hoffmeister, who claims to have designed it himself, with Wiles & Fisher building it at a cost of $8,000. It had a 25′ frontage to Granville, but stretched to 75′ on the lane, behind the next two 2-storey buildings to the north. 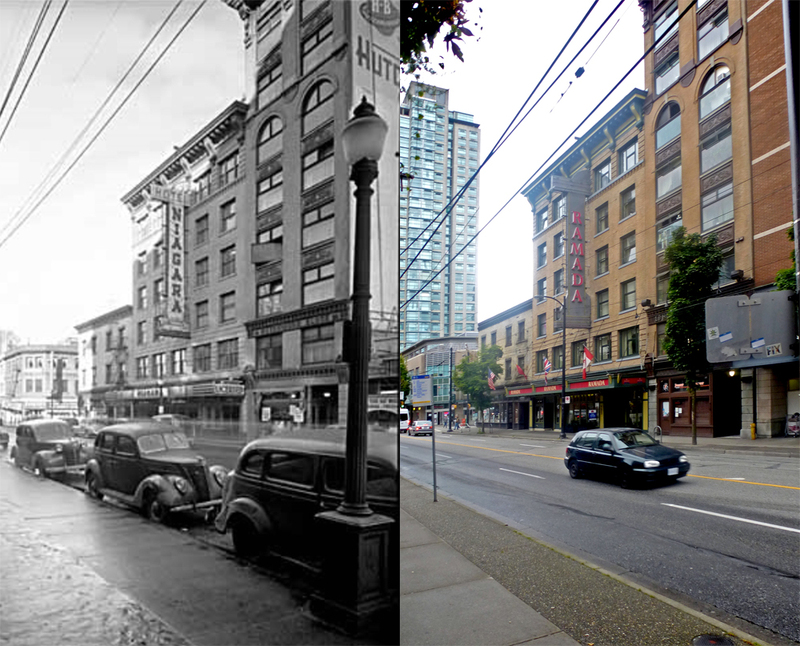 Reinhart Hoffmeister in 1912 was an electrical engineer and contractor who operated his own electrical machinery and supplies company from 1271 Granville, (the building behind the car in this 1935 image), so quite probably designed both buildings. Both R and H Hoffmeister also owned property on the same block on the opposite side of the street: Henry (known as Harry) and George Hoffmeister operated a car dealership on Pender Street offering both gasoline and electric models, and were electrical engineers as well. Harry had arrived from Ontario in 1886, one of seven brothers whose father was an international lawyer living in Clifford, Ontario. Reinhart followed a little later in 1888; a steam engineer in a flour mill, he learned about electricity as it was being installed for the first time. William, another engineer arrived in 1893, having worked for Allis machinery and the Pullman company. 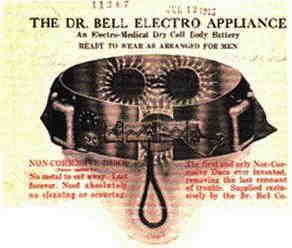 Hoffmeister’s were dealers for the Dominion, and the E N F (Flanders), and Detroit Electric vehicles: according to Major Matthews in an interview with Reinhart, architect Thomas Fee bought the first electric vehicle. The Hoffmiester company were pioneer electrical contractors; castings were designed by the company to make generators that supplied electrical power to a number of the city’s earliest businesses, including the pulp mill in Port Mellon and the BC Sugar refinery. Mr. Hoffmeister also had an interest in the Vancouver Manufacturing and Trading Company; a sash and door and furniture factory that also made pails and tubs, with a sawmill in connection with it as well located at the foot of Burrard Street. Reinhart Hoffmeister’s building was Williams Piano House in 1978 (a company that had moved into the building in the early 1950s), and it’s a private liquor store today. At some point between the 1930s and the 1970s the sash windows were replaced with aluminum, and the brick detail lost to stucco. Here’s Dixon’s Motors Ltd in 1921. It was built in 1917, when it cost $7,000 to build. Copp Brothers both designed and built the structure, which the building permit says was for F T Anderson. We suspect that might be F T Andrews, who developed a number of other buildings on Granville Street (including another garage at Pacific), and lived nearby in the Palms Hotel, that he also owned. As with many other Downtown buildings that we’ve looked at, this was part of the city’s motoring concentration. As well as a group of businesses on Georgia, and on Burrard, there were several in this area of Granville. We saw another image of this building in an earlier post. Dixon Motors Ltd were a Ford dealership offering the usual range of service, parts accessories and tires. This was a new company, managed by L A Dixon. They temporarily occupied premises on Howe Street. The Daily World, in reporting the move, noted the benefits of their new location being on a corner: “The frontage on Granville Street will be used for a spacious showroom and office. The entrance to the garage and service department will be from Drake Street, so that there will be no congestion of traffic on a crowded thoroughfare like Granville Street, and the danger of backing – out from the garage into street cars or jitneys will be eliminated.” We didn’t successfully identify F T Anderson – there were several possible candidates in the city at that time. In 1925 Dixon’s were still in business, and Mutch’s tire store was at 1275 Granville, a building developed by Reinhart Hoffmeister. He also built the building next door for his electrical contracting business in 1912; (behind the car in this 1935 picture that we first posted in 2012). 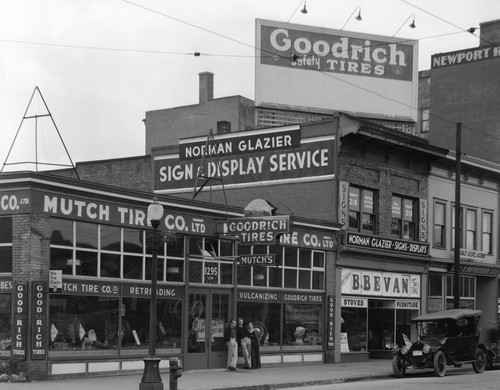 The Mutch Tire Co had moved next door, offering Goodrich Tires supplied by the B F Goodrich Company of Akron, Ohio (the B F stating for the founder, Benjamin Franklin Goodrich). The company started life in Hastings-on-Hudson in New York, but Akron paid Dr. Goodrich to relocate his business, no doubt to the eternal relief of Hastings-on-Hudson. By the late 1920s the dealership had been taken over by Fordyce Motors, and the dealership switched briefly to being a Chrysler dealership. Fordyce moved to new premises on Burrard in the early 1930s, when we assume Mutch’s tire company moved next door. Their former premises remained vacant, but a year later Turnbull & Usher, auctioneers moved in, although Barnard Bevan (also an auctioneer) had his name on the façade. A year after that Bevan had moved a block north, and the Crescent Furniture Co. moved in. Tenants in the smaller retail unit changed many times until the mid 1940s, when Julius Shore Mail Order House, an upholstery dealer moved in, Mutch Tires stayed on. They were still here in 1950, but by 1955 had become BC Tire and household appliances, with a piano store next door at 1275 Granville. Here are three buildings, each over 100 years old, that have survived on the same block. This 1947 Vancouver Public Library image shows the Niagara Hotel in the centre, built in 1913 and opened as the Hotel Connaught. It was designed by Otto Moberg for William Walsh. Next door is the taller, and narrower Hutchinson Block, designed by W F Gardiner for Dudley D Hutchinson. Gardiner used a design of centre-pivoted window frequently, but not exclusively used by Parr and Fee. The Connaught cost $55,000 and was built by H Murray, while the Huchinson Block, described as a reinforced concrete store & office, 8 storeys cost $60,000 and was built by Adkison & Dill in 1910. When it opened the Hotel Connaught, run by local hoteliers White and Passarini, boasted a French chef, and fifty of the 120 rooms had a bath! (And in those bathrooms were “individual cakes of soap, little glass shelves and all the little dainty wrinkles that make for perfection“). The hotel boasted the first oil-fired heating plant installed in any hotel in the city. The hotel lasted a relatively short time as the Connaught; by 1922 it had become the Balfour Hotel, run by Albert Davis and only a year later it was rebranded again as the Niagara, run by E R Rickman and W A Badger. The Heritage Statement of Significance identifies Walter William Walsh as the developer of the hotel; a successful lawyer and partner in Williams, Walsh, McKim and Housser. Originally from Montreal, after graduation he headed west and was called to the bar in Vancouver in 1899. Interestingly, biographies published in 1913 and 1914 make no reference to any property development activities, which made us wonder if he wasn’t the developer at all. Checking the Building Permit we found that William Walsh is named there. He was president of the Metropolitan Trust Co Ltd – so a much more likely candidate for a significant development (especially as they had offices on the third floor of the Hutchinson building next door). Born in Quebec he was aged 52 when the arrived in Vancouver in 1896. In Quebec he was a wholesale clothing merchant; here he reinvented himself as a financier. He had a new home built on Granville Street at Matthews in 1912 that cost $15,000, designed by N Murray who might easily be the H Murray who built the Connaught. In 1947 the hotel was given one of the city’s finest signs, A replica Niagara Falls, 60 feet above the ground with 45 feet of spilling blue-vein neon water, cascaded down the building over four floors. Silver spray crashed onto neon rocks edged by neon evergreen trees. It was installed by Neon Products and designed by Laurence Hanson. Initially, after rebranding as the Ramada in 1998, only the lettering was changed. Then in in 2005 the dynamic elements of the design were removed, leaving just the oversized corporate logo. Dudley DeCourcey Hutchinson arrived in the city from Winnipeg in 1906. Born in Barbados where his father, John Inniss Hutchinson was manager of a sugar plantation, he quickly established himself in the ballooning real estate business, and built his first investment on Pender. Keen to improve his financial position, Mr. Hutchinson appears to have been a little too keen on at least one occasion. Hired by Amos Fleming to broker a land purchase, he quoted $220 an acre for one piece of land. He successfully negotiated to pay only $180 an acre, but omitted to mention this to Mr. Fleming, thus pocketing the difference. On a second lot he claimed that he was going to have to pay more than an agreed initial price, and persuaded Mr. Fleming to pay that amount, while actually completing the transaction at the original price. Court records from 1908 tell the story: “The defendant then invested the profits he had made on these transactions in the purchase of four other city lots and the plaintiff, on discovery of the deceit and artifices which had been practised in connection with his business, brought the action for a declaration that the defendant was his agent and became trustee for him of the four other lots purchased by the defendant with the secret profits he had thus made, or, in the alternative, to recover the amount of the difference between what he had been obliged to pay for the two lots and the prices actually paid to the vendors for them by the defendant.” Having lost in court, and appealed and lost again, Mr. Hutchinson had to repay the difference in the price of the two transactions and not receive any commission. A year later, still aged only 25, he built the Hutchinson Block, and three years after that a West End apartment building, Grace Court. When it first opened the Hutchinson Building had eight different real estate offices as tenants – and that was just on the ground floor. There were eight more on the upper floors, as well as others including the offices of the Diocese of New Westminster, the Central Coast Mission, the Western Canada Amusement Association, architects R M Fripp, and further up the building Claude P Jones, the Trussed Concrete Steel Co of Canada, the African Plume Parlor and Pacific Coast Lumber. By the end of the war, eight years later, the building was vacant. A year later it’s pretty clear that the building had been converted to residential use; half the tenants being women. There were a few offices on the lower floors; the Norwegian Consulate was here in the 1920s. Later the building got a name; the Montgomery Apartment Hotel. 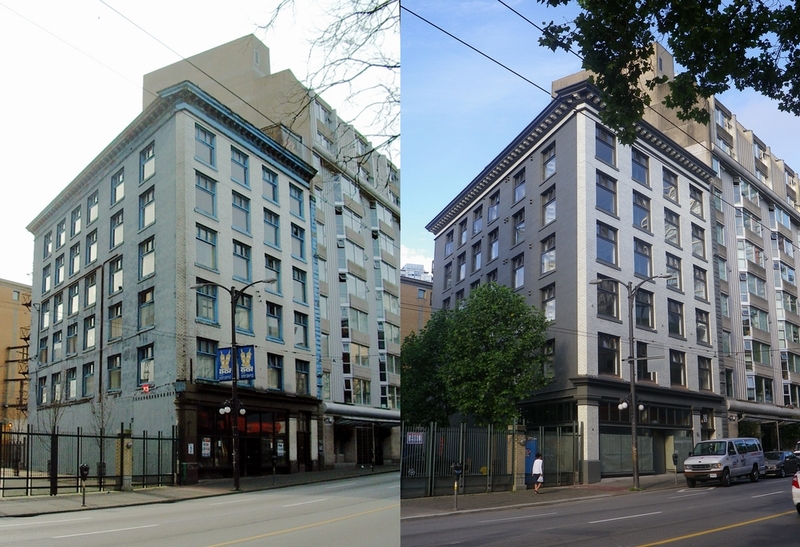 Over time it became a more run-down SRO hotel the Park Hotel, until acquired by BC Housing who gave it an entirely new life with restoration of the high quality and highly detailed sheet metal cornices, spandrel panels and belt courses. The façade was fully restored to its original condition, replacing many of its prominent cornices and restoring the storefront to something closer to its original design. The Empress, the smaller building on the corner is an even earlier structure,with rooms over retail space, built in 1906. The owner of the land was Chinese merchant Sam Kee who acquired the two 25 foot lots at the corner of Pender and Richards in 1904, although the building permits for that period are lost so no architect has been identified. Chinese investment outside Chinatown wasn’t encouraged, so often a go-between was used to manage the properties. These days the corner building is the home of MacLeods Books. We shot this 2004 image before the renovation that transformed the Burns Block into rented micro units from a (very) run down SRO hotel. There is an older image (below) that we can’t replicate (because it was photographed from a window across the street) when the building was 18 years old, in 1927. That image gives no sense of the unique triangular shape of the building, squeezed into a very tight space between the Pantages Theatre (or rather, the building that was there previously, as the Pantages was built in 1916), and the rail right-of-way that crossed Hastings Street. The 1927 image shows the names on the windows of the upper floors, so we can see who occupied which floor. On the main floor was Burns & Co’s meat shop. Patrick. P. Burns & Co were western Canada’s largest meatpacking company and Dominic Burns, ran the BC arm of the family business established by his Alberta-based brother. Dominic was wealthy enough to fund the $400,000 Vancouver Block on Granville Street in 1910 (with completion in 1912) and move to the top floor penthouse where he lived until 1933. He’d been in Vancouver as early as 1899 when he helped establish the local branch of the family meat business from Cordova Street. In 1927 the Marine department of P Burns and Co operated from the 3rd floor with E R Flewwelling, Manufacturing Jewelry and Engraving. Dr. Humber, dentist and Dr. Roach, surgeon shared the second floor with International Correspondence School. On the fourth floor was T K McAlpine, Physician and Surgeon, on the floor above Dr Emma Greve, chiropractor, had her offices next to the name of Parson & Smith – although that company had moved out a while earlier. The top floor was anonymous, but held the premises of the Y W C A club and lunch rooms. We’re not really sure when office use was abandoned and the building became a Single Room Occupancy residential building. The most recent street directory we can easily access show it was still in office use in 1955, and remarkably two of the 1927 tenants were still operating: F R Humber was still filling teeth and E R Flewwelling was making jewelry. Among the other tenants were dress designers Fashionette of Vancouver, and the International Woodworkers of America union office on the top floor. Apparently the original architects of the building are unknown – although the milk brick and centrally pivoting window design bear all the hallmarks of a Parr and Fee design, and a year later they were the architects for the Vancouver Block. The single room occupancy housing was closed down in 2006 having failed fire safety inspections (there were no working fire alarms, for example, and the fire escape exits were blocked). After a few years when it was empty, the restoration by new owners Reliance Holdings, designed by Bruce Carscadden Architects and opened in 2011, addressed seismic and structural issues as well as replacing all the building’s services and recreating the storefront. The carefully designed new residential units are less than 300 square feet, (the smallest is 226 square feet) but each has a tiny kitchen and bathroom with two-burner stoves and counter-height fridges. Wall beds and fold-out dining tables allow the room to adapt to different uses throughout the day. Rents are now reported to be a bit more than a $1000 a month. A bar called ‘Bitter’ occupies the main floor. 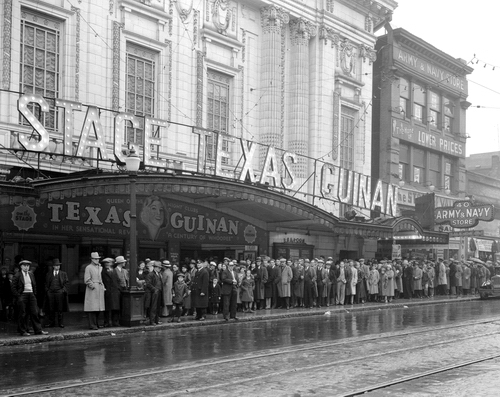 This image of the Majestic Theatre on West Hastings is dated to 1965, but the movie bill featured a 1958 western starring George Montgomery, Man From God’s Country, and a British 1962 film made by Peter Ustinov called Billy Budd. Like the opera of the same name, it was adapted from a Herman Melville short novel, and co-starred Terence Stamp in his first movie – one that earned him a nomination for an Academy Award. The western was about Montana – described on the poster as gun-raw… gun-ruled… gun hell. The theatre was heading for a dark screen, and given the double bill on offer that’s understandable. The Majestic didn’t start life under that name – it was the second incarnation in the city of the Pantages Theatre. A version was designed by J J Donellan in 1914, but the start of the war delayed the project, and the current building designed by B Marcus Priteca late in 1916 wasn’t started until 1917, with the theatre opening in 1918. Alexander Pantages developed the building at a cost of $300,000 and built by Skene & Christie on a piece of land owned by C A Godson. 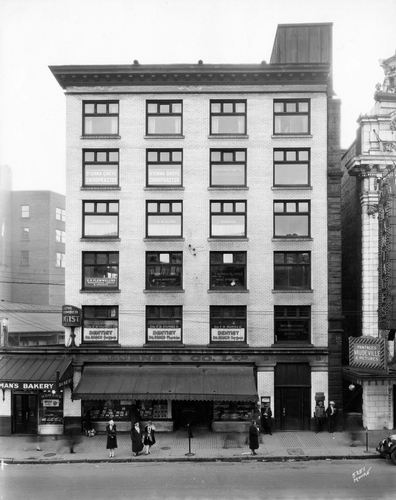 The first version of the Pantages was more modest, and located a few blocks to the east. The fancy new theatre was part of the city’s vaudeville circuit, running up to 12 hour days and mixing comedy, dance and musical acts. 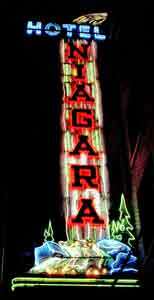 During its time as the Pantages Theatre, it headlined such stars as Charlie Chaplin, Stan Laurel, Jack Dempsey and Babe Ruth. Architectural writer Miriam Sutermeister noted that the theatre was “considered at the time to be the most richly embellished and efficient theatre of the Pantages chain.” In its final year under the Pantages name, L B Pantages was the manager and Alfonso Pantages was an usher. It was renamed as the Beacon Theatre before 1930, still showing ‘acts’ as well as movies – and talkies as ‘Birth of a Nation – in Sound’ was shown in 1932 – the year that Godson estates took over management of the theatre. In this incarnation management invested in a set of massive neon letters that the were rearranged to identify the performance. 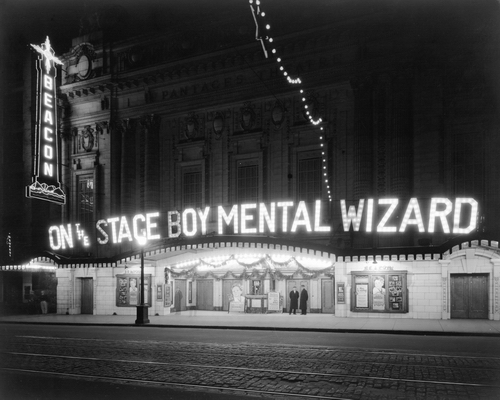 Here’s a 1932 image showing “On Stage Boy Mental Wizard” – Jackie Merkle was the five year-old son of a husband and wife acrobat team – The Flying Merkles. Jackie’s mother died in a fall when he was 7 months old and his father discovered psychic abilities a few years later and took him on the road. A year later Texas Guinan paid a visit. She was really Mary Louise Cecilia Guinan, and unlike almost all the other details of her life that she invented or embellished, she really did come from Texas: Waco to be exact. She started acting at 16, briefly married (for the first time), then headed to New York where she dabbled in films and on stage before finding her niche as a nightclub hostess with an acerbic wit (an attribute she had developed in vaudeville). During prohibition she made a fortune holding court from a stageside table, draped in jewels and furs and greeting the clients with her catchphrase “Hello Suckers!”, later referenced in the musical Chicago. She could persuade the crowd to pay $25 for a whisky, but was teetotal herself. She hung out with actors and gangsters, and then went home to her parents. She moved on from partnering with an impresario to owning her own club, and apparently amassing a fortune. The depression hit the club scene and she tried to get back into the movies, and toured a revue that was prevented from showing in France because it represented a threat to the work of local performers. (Taking a troupe of fan dancers to Paris wasn’t necessarily the most subtle idea, but it seems that Texas didn’t really do subtle). Turning lemons into lemonade, she changed the name of the show to “Too Hot for Paris,” and continued around North America with a troupe of 40 dancers. The tour ended suddenly and tragically in Vancouver; the image shows the revue attracted a sizeable crowd. While in the city Texas suffered an attack of ulcerative colitis and despite emergency surgery, she died aged 49. On her deathbed she was reported to say “I would rather have a square inch of New York than all the rest of the world” and her body was returned home where thousands attended her funeral. Her family donated a tabernacle in her name to St. Patrick’s Church in Vancouver in recognition of Father Louis Forget’s attentions during her final hours. 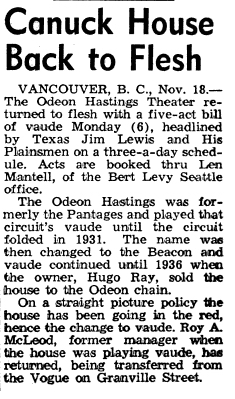 The building’s next reincarnation was as the Hastings Odeon picture house in 1946, when it was bought for $250,000. There were continued occasional live performances; Billboard reported in 1949 that having been “a straight flicker for the past two seasons, reverted to flesh Thursday (14) with a seven act bill and a feature pic… The seven circus acts which made up the opening bill included Snow’s seals, Perry the Penguin, Pansy the Horse, Hector’s dogs, Flying Olympians, Togo the clown, comedy jugglers and the Trampoline Trio“. A year later another vaudeville bill was announced headed by Texas Jim Lewis and his Plainsmen. The BC Archives have a CBC film from 1956 conductor John Avison rehearsing a 50-piece orchestra in two works, including a Liszt piano concerto with soloist Marie-Aimee Warrot. There was another attempt to revive vaudeville in 1958 – this time as the Majestic. The acts were brought in from Las Vegas, and Carl de Santis and his orchestra provided the music. There were still two movies, but the theatre struggled and vaudeville really was, finally, dead. The Odeon decided to sell the building to a parking lot operator who razed the building in 1967. This raised some public protest, although not enough to save the building. The parking lot remained for over 30 years, until the Portland Hotel Society hired Arthur Erickson (with Nick Milkovich) to design non-market housing on the site, completed in 2000. When site works commenced the contractors discovered that the demolition crew of the theatre just pushed rubble into the basement and paved over it; the basement had been sitting there largely intact. The Portland offers 88 units, and was the first purpose-built housing project designed specifically to meet the unique needs of Vancouver’s hard-to-house community. We’ve looked at the history of the Boulder Hotel (on the right) some years ago, and we looked at it again more recently. On the corner on the left is the Rainier Hotel – we also looked at the history of this building several years ago. Beyond is one of the oldest buildings in the city – and certainly the grandest of the city’s early buildings; the Dunn – Miller Block. We’ve looked at parts of it in various posts – the buildings removed to build it in 1889 were featured here, and we’ve seen odd bits of the façade, like Clarke & Stuart’ s store in 1898, as well as how it looked in the 1960s. Here’s how it looked in 1990. The Dunn – Miller block, it turns out, wasn’t really a complete building – more a unified façade designed by N S Hoffar, with a variety of businesses adding their own premises behind. 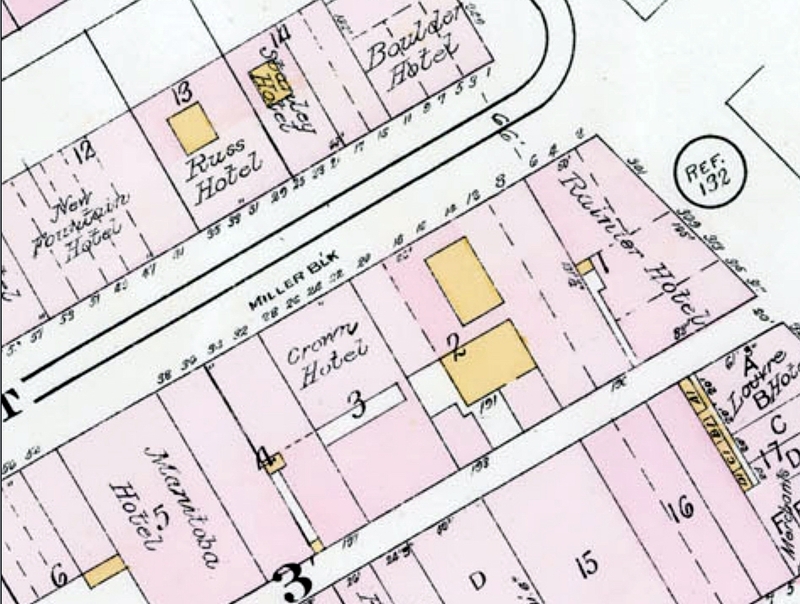 A good example of this is the Crown Hotel, that occupied 75 feet of façade slightly to the west of the central portion of the block in 1912, as this extract from the Goad’s insurance map shows. It was numbered as 22-28 Cordova Street. Before 1911 there was a hotel called the Crown here; when the building was first completed in 1889 all the retail units were occupied, and there were few tenants listed on upper floors (including a real estate office and a barrister at 44 Cordova). By 1892 it looks as if 22 Cordova was in residential use – it’s difficult to imagine why a streetcar conductor would have an office here. In 1894 John Decker was running the Crown Saloon on Carrall Street. Two years later it was listed as the Crown Hotel, but reverted to the Crown Saloon two years after that. From 1907 the Crown Hotel is listed at this address, still run by John Decker. John was originally from Germany, arriving in Canada in 1886. His wife Alice was American, and their three children, John, Willie and Alice were all born in BC. In 1909 Mrs Alma Peterson’s jewellery store was on the main floor at 26 and Zarelli’s confectionary store at 26 1/2 (replaced by the Imperial Restaurant in 1910) and Joseph Sudmin’s clothing store at 28. In 1911 the hotel was rebuilt at a cost of $30,000; accordiung to the building permit it was designed by ‘F Gardner’ – actually Francis Gardiner, brother of architect W F Gardiner. The owner at the time was a surprise to us; a Chinese businessman, Lung Kee. It’s likely that this was L O Kee who also imported dry goods at an East Hastings address. In 1912 the street directory shows the Crown Hotel being run by Alfd Manson, prop, 22-24 Cordova W. The bartender was Hans Christian, who lived in the Stanley Hotel (across the street). John Decker had moved on to run the Traveller’s Hotel on Abbott Street with A Burr, and was living on Haro Street in the West End. A Lung family household of at least 7 members residing in Vancouver was recorded in the 1901 census. The head of household, Kee Lung, was born in China in 1851. The census identified his heritage as Chinese and showed he immigrated to Canada 27 years prior in 1874 when he was 23 years old. By 1901, at the age of 50, he had an occupation that was recorded as “Store Keeper”. Kee’s wife was Kee Mary Lung, who was 30 years old. Mary was born in China in 1870. Also identifying her heritage as Chinese, she immigrated to Canada in 1884 (when she would have been 14 years old). There were five children, 4 boys and a girl. In 1889 their eldest child, a boy named Mahie, was born. One year later, in 1890, when Kee was 39 years old and Kee Mary was 20 years old their second son, Man King, was born. In 1892 their daughter, Kee Ma Han, was born followed in 1898 by Malang, a boy and in 1901 by another son, Mashe. In 1901 the Lung family children’s ages were 3, 5, 8, 10, and 11 years. The Crown stayed in business for many years, but reverted to offering managed rooms rather than a full service hotel. From time to time the building continued to have Chinese connections – either in terms of the café downstairs, or who ran the hotel. In 1919 it was listed as the Crown Hotel Rooms, run by K Kawano, while the bar was run by S Swaboda. Two years later the rooms were run by Samuel Riardan, and two years after that, C Hiraki. Although the hotel continues to be listed, there’s no proprietor associated with it. By 1926 the bar wasn’t mentioned, but there was a Crown Café, (Chinese) run by John Hing. In 1930 K Kosaka was running the Hotel Rooms, and the Beer Parlour was shown as being back in business at 28 W Cordova with J Shelling and A Didinsky running the bar. The Crown Café was now the Sunset Café, shown at the same address. At 22, J Grimaldi was running the Crown Jewelry store. The depression seems to have had an affect on the businesses: in 1934 the Rooms were still operating but the jewelers had become Crown Tailors, selling second hand clothing, and the bar isn’t mentioned, although the Sunset Café is still being run by Jon Hing. In 1939 K Kosaka is still running the rooms, but the café had become the Golden Café, run by Sam Wong. During the war the Café became the Victory Café – a bit premature in 1942. No longer Chinese, it was run by G Maystovich. Mrs K Kosaka was running the Crown Hotel Rooms. By the end of the war, everything changed again. The Cansino Hotel, run by Mann Kuan and Wo Joon is shown at 24 W Cordova, and Harvey’s Boot Factory had occupied 28. We saw that business located a bit further up the street in an earlier post. The Cansino was still in business with one of the same owners a decade later, (M and S Kuan and C T Chan). The Army and Navy store restored elements of the Classical-style façade in a remodelling of the entire store completed in 1974 that extends to Hastings Street (with a lane still bisecting the upper floors of the store). 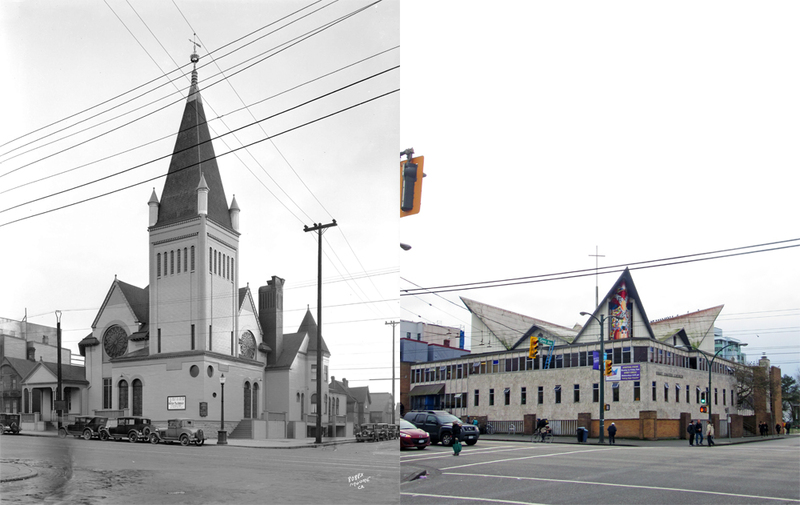 Here’s another building that, like the Salvation Army Citadel across the street, is in a second incarnation in the same location. Like the Citadel, it’s unlikely to be around too much longer, although the role of a church here is expected to continue in the future. It’s said to be seen here in a 1931 photograph – although we have doubts. That’s because it has a sign on the side proclaiming ‘Ramsay MacDonald’. There’s nobody in the city of that name (we checked!) but there was the British politician of that name who was a former Labour Prime Minister and who visited the city in 1928, when he dedicated the Robert Burns statue in Stanley Park. He was also a Presbyterian. Clearly the structure as built wasn’t of brick and stone construction – it’s wooden, making a serious attempt to look brick-like, although the foundations of the building were stone. We’re assuming that Mr. Sansom retained the commission for the church’s design and didn’t storm off the job when he discovered the budget wouldn’t stretch to brick. Initially there was a competition to design the new building, won by an American, Arlen Towle, who had an office in New Westminster, so it’s possible he was the architect. It was replaced with the building that’s there today in 1964. 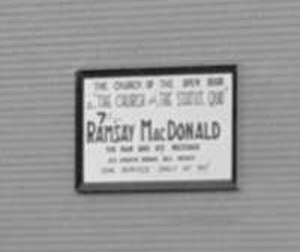 The architect was James Earl Dudley; he moved here in the mid 50’s and lived in the UBC endowment lands where he went to the United Church. He also designed the new United Church on the University Boulevard, and that was the connection to him designing this church. Today the church also serves as a low-barrier shelter, although at a significantly reduced level compared to a few years ago when it operated controversially as a 200-bed dormitory. Today it provides 60 beds each night– space for 40 men and 20 women. Shelter residents have 24-access to the building and are provided three meals a day, seven days a week. The church partner with Carnegie Outreach Team and BC Housing to help shelter residents transition to appropriate permanent housing. Longer term redevelopment plans are reported to intend to retain a church, possibly a continued shelter use, and other non-market housing.